As well as the environmental and economic costs, illegal mining has also caused much human suffering. In the first week of July, 22 miners became trapped deep underground in an illegal mine. Rescuers tried unsuccessfully to reach them for five days but were forced to concede defeat, declaring the men dead and sealing the pit. One of the victims, 30-year-old Kojo Kandanoba, had been mining illegally for six years and used the meagre income to help provide for his family, his cousin Andrew Anchaba told AFP. "He made some amount of profit from his work, that is what he used in catering for his parents and some other family members," Anchaba said. An illegal miner himself, Anchaba said that many like him fear that the government crackdown will hurt them financially. "We were aware of the ban on illegal mining but that was the only job available here and you know we cannot go and steal," he said. "The government has promised us jobs but we are not seeing anything so we also continue to mine." Maame Esi Eshun, a research analyst at the African Centre for Economic Transformation, said that small-scale mining is largely driven by poverty. Her study on the practice in Ghana, Burkina Faso and Sierra Leone found that mining was more appealing than agricultural work for many rural poor because it was seen as offering quick returns. It also helped miners raise funds to buy farm equipment, she found. An estimated one million people are involved in illegal mining in Ghana and each typically earn between $100 and $300 per month, she said. Those who opted to farm could be expected to earn just $70 a month. Otabil, the ministry official, said the government would try to support miners to shift away from their illicit incomes. "Within the next five years, we should be able to help many more people acquire work and jobs on their own, set up their own businesses and forget this illegal mining business," he said. 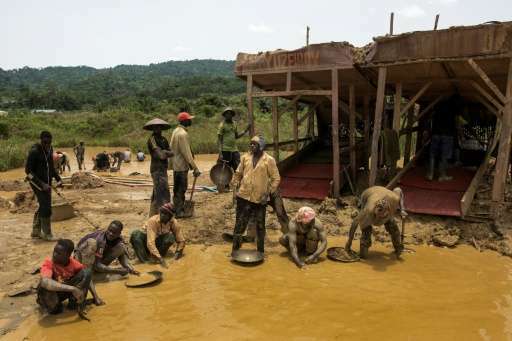 But illegal mining does not just attract Ghanaians: some 50,000 foreigners are thought to be involved, according to an Oxford Business Group report published in 2015. At least 200 Chinese nationals have been arrested in connection with illegal mining so far this year, Otabil said. A media backlash against China over its citizens' involvement in galamsey prompted a rare rebuke from Beijing's ambassador who in April called on Ghana's government to "guide the media to give an objective coverage on the illegal mining issue". President Nana Addo Akufo-Addo recently defended the crackdown, saying that it was in the national interest. "We are not against the Chinese or any other citizens but what we are all seeking is to protect the integrity of our environment to secure a better future for unborn generations," he told local media.